LAS VEGAS, (Reuters) – A retiree armed with multiple assault rifles strafed an outdoor country music festival in Las Vegas from a high-rise hotel window on Sunday, slaughtering at least 59 people in the deadliest mass shooting in modern U.S. history before killing himself. The barrage of gunfire from the 32nd-floor of the Mandalay Bay hotel into a crowd of 22,000 people came in extended bursts that lasted several minutes, as throngs of terrified music fans desperately cowered on the open ground, hemmed in by fellow concertgoers, while others at the edge tried to flee. More than 525 people were injured – some by gunfire or shrapnel, some trampled – in the pandemonium adjacent to the Las Vegas Strip as police scrambled to locate the assailant. Police identified the gunman as Stephen Paddock, 64, who lived in a retirement community in Mesquite, Nevada. Authorities said they believed he acted alone, though his motive was unknown. The Islamic State militant group claimed responsibility for the massacre, but U.S. officials said there was no evidence of that. At least a dozen people were in critical condition at University Medical Center in Las Vegas where the most seriously injured victims were taken, a spokeswoman said. The preliminary death toll, which officials said could rise, surpassed last year’s record massacre of 49 people at a gay nightclub in Orlando, Florida, by a gunman who pledged allegiance to Islamic State. The dead in Las Vegas included a nurse, a government employee and an off-duty police officer. Shocked survivors, some with blood on their clothing, wandered streets after the shooting, where the flashing lights of the city’s gaudy casinos blended with those of emergency vehicles. Police said Paddock had no criminal record. The gunman killed himself before police entered the hotel room from where he was firing, Clark County Sheriff Joseph Lombardo told reporters. 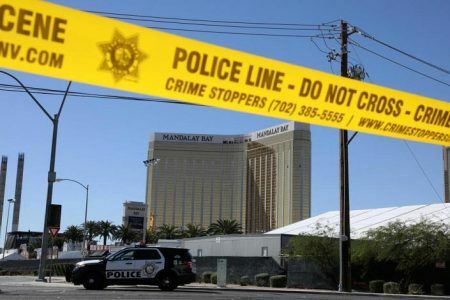 “We have determined to this point no connection with an international terrorist group,” Aaron Rouse, special agent in charge of the Federal Bureau of Investigation (FBI) field office in Las Vegas, told reporters. CIA spokesman Jonathan Liu, said in a separate email: “We advise caution on jumping to conclusions before the facts are in.” Lombardo said 16 rifles were found in the room where Paddock killed himself, some with scopes and some that appeared to have been modified in an attempt to convert them into machine guns. Lombardo said the gunman apparently used a “device similar to a hammer” to smash the windows from which he fired in the two-room hotel suite where he had been staying since Thursday. More than 10 suitcases were in the suite. Lombardo said a search of the suspect’s car turned up a supply of ammonium nitrate, a fertilizer compound that can be used in explosives. It was used in the 1995 truck bombing of the Alfred P. Murrah Federal Building in Oklahoma City that killed 168 people. 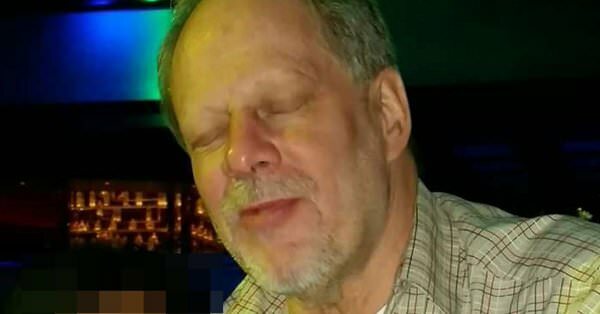 Police found at least 18 additional firearms, some explosives and thousands of rounds of ammunition at Paddock’s home in Mesquite, about 90 miles (145 km) northeast of Las Vegas, along with “some electronic devices that we are evaluating at this time,” Lombardo told reporters. He said police were standing by in northern Nevada to search a second house connected to Paddock. 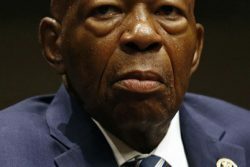 “He never gave any indication or reason to believe he was unstable or unfit at any time,” Sullivan said, adding that his business was cooperating with investigators. He did not say how many or the kinds of weapons Paddock purchased there. Lombardo said investigators knew that a gun dealer had come forward to say that he had sold weapons to the suspect, but it was not clear if he was referring to Sullivan. He said police were aware of “some other individuals that were engaged in those transactions,” including at least one in Arizona. Investigators also want to interview Paddock’s girlfriend, identified as Marilou Danely, who Lombardo said was believed to be in Tokyo. She was initially described by police as a “person of interest” but not a suspect. The shooting, the latest in a string that have played out across the United States over recent years, sparked a renewed outcry from some lawmakers about the pervasiveness of guns in the United States, but was unlikely to prompt action in Congress. Nevada has some of the nation’s most permissive gun laws. It does not require firearm owners to obtain licenses or register their guns. The Second Amendment of the U.S. Constitution protects the right to bear arms, and gun-rights advocates staunchly defend it. U.S. President Donald Trump, a Republican, has been outspoken in his support for the Second Amendment. The White House said on Monday that it was too soon after the attack to consider gun control policies. “Today is a day for consoling the survivors and mourning those we lost,” presidential spokeswoman Sarah Sanders said at a news briefing. Trump said he would travel to Las Vegas on Wednesday to meet with victims, relatives and first responders. “It was an act of pure evil,” said Trump, who later led a moment of silence at the White House in honor of the victims. The suspected shooter’s brother, Eric Paddock, said the family was stunned by the news. He said his brother belonged to no political or religious organizations, and had no history of mental illness. Their father had been a bank robber who for a time was listed on the FBI’s “Ten Most Wanted” list of fugitives. 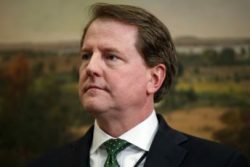 Speaking to reporters from his doorstep in Orlando, Florida, he described his brother as “a wealthy guy” who liked to play video poker and take cruises. He seemed to have been settling into a quiet life when he moved back to Nevada from Florida. The gunfire erupted as country music star Jason Aldean was performing on stage. Video of the attack showed terrified crowds fleeing under rapid gunfire as the shooter took aim from a distance of around 1,050 feet (320 m). “People were just dropping to the ground. It just kept going on,” said Steve Smith, a 45-year-old visitor from Phoenix, Arizona. “Probably 100 shots at a time,” Smith said.